A piece of rather distressing, yet not surprising, news (from a Sunday Miami Herald‘s: a story from the Florida Center for Investigative Reporting) recently surfaced, revealing information from former Florida Department of Environmental Protection (DEP) employees. Apparently, according to some former DEP volunteers, officials, and one attorney (former employee of the DEP Office of General Counsel in Tallahassee from 2008 to 2013) were told not to use the terms “climate change“, “sustainability“, or “global warming” in emails, reports, or official communications. This unwritten policy went into effect shortly after Governor Rick Scott took office in 2011. The former attorney, Christopher Byrd, is now in private practice as an environmental lawyer in Orlando and he did not agree with such unwritten policy. In Orlando Weekly: When questioned by the Center for Investigative Reporting on the ban of these terms, the DEP insisted that it didn’t have a policy on the topic. But as we already know from looking into other areas of Scott’s administration, not keeping records about important communications, decisions and policies is part of how it does business. In Miami Herlad: In 2014, in response to Gov. Scott’s comment that he “was not a scientist” when asked about his views on climate change, a group of Florida scientists requested to meet with Gov. Scott to explain the science behind the phenomenon. These scientists were given 30 minutes but really only had 20-21 minutes. 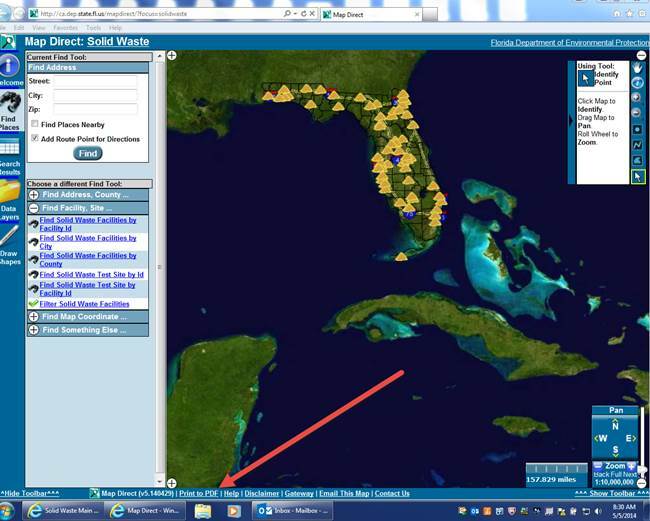 What can we do to protect our environment here in Florida? Firstly, we have to be well informed by conscientious government officials. We have to protect those who are willing to speak the truth and be insured of employment. So, this is what I’d propose: gather our previous posts of our sister publication, in Sun Is The Future, For Solar Landfills-More Help With Landfill Closure Requirements in Florida, Landfills+Community Solar=Great Opportunities & Savings, former FL-DEP attorney Christopher Byrd, and interested potential investors to become familiar with the concept and procedures in Start A Community Solar Garden/Farm. My fellow Floridians, there are much investment potentials here in Florida waiting to be discovered. For those of you who do not have huge sum of cash flowing around, you may consider pulling funds from various sources and form your own microfinance groups or ask the world to help you to convert your local landfills into community solar gardens via crowdfunding! Click on the “Loans & Grants For Small Businesses” of Windermere Sun and learn how to raise money from all corners of our planet. Then check with environmental attorney Christopher Byrd (407-502-5182 or 407-929-4628) for specific procedures in developing your community solar gardens/farms from landfills. The world is so well connected that we need not dwell on the negatives! Our time is too precious to be wasted on the negatives! We need to concentrate our time, energy, and effort toward the solution. In my book, Solar Energy is the ultimate solution that will solve: Energy-Pollution-Slow Down Climate Change-Avoid International Conflicts. What are we waiting for, Floridians, let’s bring back the Sunshine To Our Beloved Sunshine State! Contrary to Governor Scott, we do not choose to wish the problem away by not talking about it, we need to talk about it and work toward the Solar Solution For Sunshine State! Any of your comments or suggestions will be welcomed via sunisthefuture@gmail.com“”. Furthermore, Engineer Lee Martin also provided us, below, some important points for the landfill closure requirements for state of Florida, in case any of you out there should be interested in considering taking on any solar/wind projects utilizing any of the Florida landfills. 1. Landfills shall have a final cover designed to minimize infiltration and erosion, which shall include a barrier layer consisting of a soil layer, a geomembrane, ora combination of a geomembrane with a low permeability material. All geosynthetic and soil components used in the final cover shall meet the standards and specifications contained in subparagraphs 62-701.400(3)(d)1. and 2., (3)(d)5.-11., paragraph (e), and (f), F.A.C. For lined Class I and Class III landfills, the barrier layer shall have a permeability that is substantially equivalent to, or less than, the permeability of the bottom liner system. If the landfill uses a geomembrane in the bottom liner system, the barrier layer shall also incorporate a geomembrane. For unlined Class I landfills, the barrier layer shall have a permeability of 1 x 10-7 cm/sec or less. For unlined Class III landfills, the barrier layer shall have a permeability of 1 x 10-5 cm/sec or less. For unlined Class III landfills which accepted only yard trash, no barrier layer is required;instead, final cover shall consist of a 24-inch thick soil layer, or a 30-inch thick layer consisting of approximately 50 percent soil and 50 percent ground or chipped yard trash by volume, the upper six inches of which shall be capable of supporting vegetative growth. 2. If the barrier layer consists only of soil, it shall be at least 18 inches thick, installed in 6-inch thick lifts, and shall have a final, 18-inch thick layer of soil, or a 24-inch thick layer consisting of approximately 50 percent soil and 50 percent ground or chipped yard trash by volume, that will sustain vegetation to control erosion placed on top of the barrier layer. 3. If the barrier layer consists only of a GCL, a protective soil layer at least 24 inches thick shall be placed on top of the GCL with the upper six inches being able to sustain vegetative growth. In the alternative, the GCL may be covered with a 12-inch thick layer of soil that is then covered with a 15-inch thick layer consisting of approximately 50 percent soil and 50 percent ground or chipped yard trash by volume, with the upper six inches being able to sustain vegetative growth. The GCL shall be placed on a protective soil layer at least six inches thick. Material specifications and installation methods, which may include a drainage layer between the GCL and the protective soil layer over the GCL, shall be adequate to protect the barrier layer from root penetration, resist erosion, and remain stable on the final design slopes of the landfill. 4. If a geomembrane is used in the barrier layer, it shall be either HDPE or LLDPE with a minimum average thickness of 40 mils or PVC with a minimum average thickness of 30 mils, shall have chemical and physical resistance to materials it may come in contact with, and shall withstand exposure to the natural environmental stresses and forces throughout the installation, seaming process, and settlement of the waste during the closure and long-term care period. A protective soil layer at least 24 inches thick shall be put on top of the geomembrane. In the alternative, the geomembrane may be covered with a 12-inch thick layer of soil that is then covered with a 15-inch thick layer consisting of approximately 50 percent soil and 50 percent ground or chipped yard trash by volume, with the upper six inches being able to sustain vegetative growth. Material specifications, installation methods, and compaction specifications, which may include a drainage layer between the geomembrane and the protective soil layer, shall be adequate to protect the barrier layer from root penetration, resist erosion, and remain stable on the final design slopes of the landfill. This layer shall include topsoil or soils that will sustain vegetative growth. 5. The final cover design shall include an evaluation of the stability of the cover system and the disposed waste and shall be designed to meet the factor of safety criteria in subsection 62-701.400(2), F.A.C. This evaluation shall include an analysis of the potential for slides along the weakest interface of the final cover system and of the potential for deep seated rotational or translational failures through the waste and the final cover. 6. An applicant may use an alternate design for the barrier layer or parts of the barrier layer, or for the protective soil layer, upon a demonstration that the alternate design will result in a substantially equivalent rate of storm water infiltration through the final cover. Any alternate design shall be reviewed by the Department as part of its review of the closure design plan. 7. Nothing herein shall preclude the Department from requiring more stringent final or temporary cover designs in a permit or consent order if necessary to protect the public health or the environment because of the nature of wastes received or site specific geological or hydrogeological conditions, or if the landfill has not been adequately constructed, operated, maintained, or closed. Engineer Lee Martin apparently will be retiring from FL DEP within 3 months or so. So, if you need any additional guidance in the next three months, please refer to Lee Maritin, P.E., contact information: 850-245-8734, email: Lee.Martin@dep.state.fl.us Please contact me if you are reading this post after July, 2014 and want more guidance with landfill closure requirements. If so, email me at sunisthefuture@gmail.com for his updated contact information. Let’s hope that Engineer Lee Martin will consider consulting in the future, to guide rest of the world through all the requirements for closure of landfills in Floria in the process of covering more surface area with Solar/Renewables! Related Post: Hurray For Solar Landfill; The Amazing EGSC (Exposed Geomembrane Solar Cover) ;Landfills+Community Solar=Great Opportunities & Savings. Just came across a wonderful article at The Enterprise, by Jennifer Bray, about the town of Easton, MA, harnessing solar power from the landfill at 114 Prospect St., to pay bills. The ribbon-cutting to celebrate the 1.9 megawatt solar installation was scheduled on April 30, 2014. The town of Easton is estimating a reduction of $200,000 for the town’s electric bill as a result of this solar installation. The Borrego Solar Systems covered the cost of the project and installation of the solar panels and leased eight acres of land from the town of Easton. The town of Easton then buys the power generated at a discount. Adding the revenue, energy credits, and annual $33,000 lease, the town is expecting a total of approximately $225,000 of savings per year. Easton and Borrego Solar Systems have a 20-year contract that will save Easton nearly $4.5 million in that time frame. This solar installation will produce amount of electricity to support 235 homes per year. This is a fantastic example of how the otherwise non-buildable surface area may be put into good use, saving the town almost quarter of a million dollars annually while helping to reduce carbon footprint. I wonder how many other landfills, at MA and other states and other countries are taking advantage of their landfills. 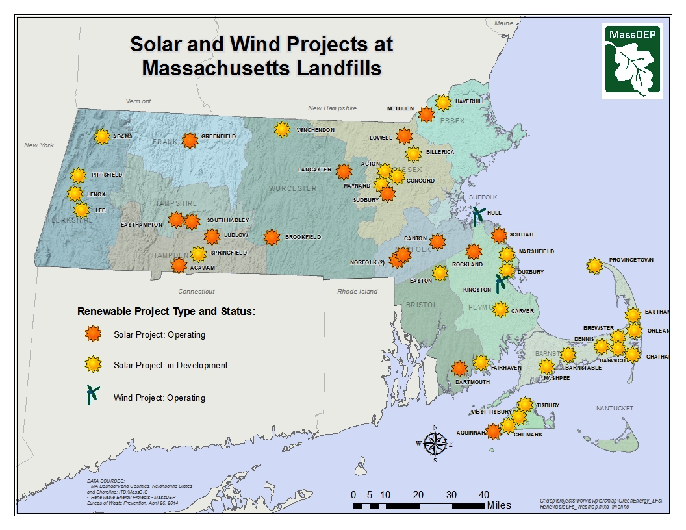 The result of my wondering led to the map shared above, Solar and Wind Projects at Massachusetts Landfills. More detailed information about each city or town of MA where the project is located, applicants, each landfill’s physical address, description of the renewable energy installation and current status of the project, and the date of MassDEP’s decision and relevant approval document(s) are available at this table. May all states in USA and other countries on planet earth soon realize the full potential of their landfills!